See You Memorial Jewelry is produced in sterling silver with a rhodium-plated finish, for a luxurious white gold radiance. It’s also available in gold, and set with diamonds. Prices are available upon request. The 100 series and 200 series have a glass or silver front. The back can be opened by a screwdriver, for the ashes to be filled using a funnel. All other pieces will be filled with ashes mixed with a special resin. The ash remains or hair is integrated with the use of a special resin, resulting in a transparent, shiny finish. The ashes can always be separated from the resin, to be used in integrating into another piece of jewelry. The durable finish will withstand everyday wear and tear. However, we always advise you to preserve an additional portion of the ashes, to be used for replacements in case of damage or loss. The resin treatment is a custom process to be performed by us or our dealers. These fingerprints will be made with the so called ‘Lost wax’ method. This means that the original wax fingerprint will be lost during the process. If you want to make sure that you will always have the possibility to make another fingerprint-pendant or other piece of jewelry that contains the same fingerprint, we will need to make a rubber model of the original wax fingerprint which is called a matrix. With this matrix we can make as many fingerprints as desired. The price for the matrix $80. The most common fingerprint-pendant is the original, round shaped, fingerprint. Other possible shapes are a heart, butterfly, square or clover. After the fingerprint has been made into silver or gold, our goldsmith will do the finishing touch. 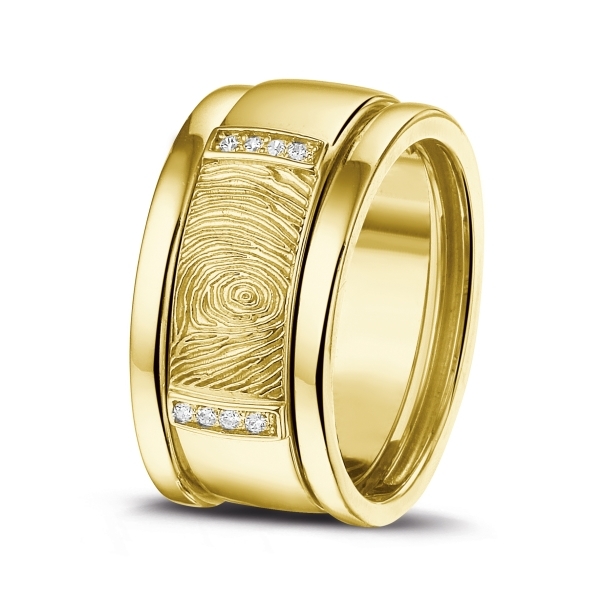 She integrates the fingerprint into the desired piece of jewelry. It is also a possibility to make a double sided fingerprint. Push the two fingers on the wax ball at the same time on opposed sides. This is a way of showing eternal commitment and love. Perfect for, for example a couple or a parent and child(ren). There’s no additional cost for a double sided fingerprint. We highly recommend to always make 2 or more fingerprints in case one impression is not clear enough. Send the two best to us and we will decide which impression is the clearest. We advise you to keep one impression at home. Another possibility is to ‘laser’ the fingerprint on a piece of jewelry. A lasered fingerprint can be made from a wax ball or from an ink impression on a piece of paper. The fingerprint will be scanned and lasered on the item that is desired. With the laser technique you have the opportunity to put the fingerprint on a curved surface. For example a ring band.